"If you build it, they will come," the saying goes. It's never that simple when it comes to playing video games online. I love Mario Kart 8, and have been playing it consistently since it came out in May. But lately I've been running into a problem: other people aren't. Or it sure feels that way, at least. When I got home one night earlier this week, for instance, one of my roommates asked me if I wanted to play a few rounds. I usually get home to find him playing Mario Kart 8, so this wasn't surprising. So we selected our racers and built out our karts the way we always do, and headed into the lobby. There were only two people waiting there. I watched the four miis stand there together in silence, fidgeting the way miis do, as a the dark blue globe of the game's loading screen swirled slowly behind them. They all looked so sad and aimless without the strength of numbers. "Let's try out global," I suggested to my roommate. We had selected regional online multiplayer, so maybe putting ourselves in front of the worldwide Mario Kart 8 community would improve our chances of finding a meaty race. We did at first, but the herd thinned down again soon after. After swapping back and forth between different lobbies a few more times, we called it a night. Playing the game itself was as fun as it ever was, of course. Even if we were only racing against another three or four people. But it felt like another obstacle had been placed in front of us, a surprisingly thick outer shell that needed to be cracked before we could get to the meat inside. There are a few different reasons why I might have ended up in this situation. 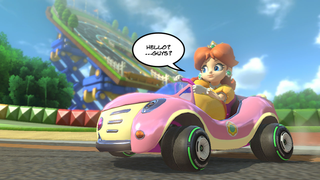 Nintendo recently updated Mario Kart 8 in a few substantial ways. The more mysterious of these altered its online multiplayer in a manner that's still difficult to understand or appreciate, but has left some fans feeling dissatisfied and uneasy. And since it first launched, the game has been without some features like a substantial online voice chatting system that many people consider basic amenities. Regardless of how systemic those issues may be, even diehard Nintendo fans admit that the Miiverse—the Wii U's overaching online ecosystem—can be notoriously opaque and difficult to navigate. All these technical issues might sound like minor nitpicky details on their own. Collectively, however, I think they might be creating a situation in which players—regardless of how strong they may be in raw numbers—are having trouble communicating with one another, and thus playing together, effectively. The game is as fun as ever for local competition, meanwhile. But I return to another core problem: the fact that I'm still alone among of my friends as the only person who's bitten the bullet and gotten a Wii U. (That being said, none of them mind borrowing it from me or asking me to lug the console over to their apartments). Mario Kart 8 might also be suffering because of the broad commercial and cultural shifts that take place every fall when a ton of exciting games all come out within days of one another—stretching gamers' attention and testing their ability to devote themselves to any single piece of work. And let's face it: there's nothing like the loot cave in Mario Kart 8. This year is particularly tough for Mario Kart in this regard because the Wii U still isn't selling well. Its core fans, meanwhile, are probably feeling more eager to play the new Super Smash Bros. at this point since its so close to release and seems novel in comparison to something that's been out in the open for several months. I'm excited for the new Smash as well. But I've always preferred Mario Kart for the way its competitive nature is less frenetically intense but just as engaging. Also, the latest game is so visually and mechanically arresting that it still manages to amazing me, even several months after release. I know that there are plenty of other Mario Kart 8 fans out there. But something about playing the game online feels more...isolated than it did even a few weeks ago. If you just scan down the Mario Kart subreddit on a given day, you'll come across a handful of posts written by people who are still playing the game but having trouble finding others who are too. For many other Mario Kart 8 players, meanwhile, the question has shifted from, "Are you still playing?" to "When will you decide to come back?" That, or: "What could convince you to come back?" I, for one, hope that the snazzy-looking DLC that's due out in November helps reassert the game's presence.